CB Insights have made an attempt at drawing up a map of the UK tech scene. It's a decent attempt, and welcome in that it gets international attention to the UK market, but it doesn't really demonstrate a great deal of insight or knowledge of the market. Missing are key exits such as Sophos (IPO this year), Acano (sold to CISCO for $700mn last month, or Maxymiser, bought by Oracle, to name just a few. Also missing are unicorns such as Skyscanner, Fanduel and VE Interactive, as well as high growth companies like SwiftKey. Meanwhile respected tech investors like Vitruvian and Summit at the growth stage, 83North and Talis Capital at the early stage, and giants such as Intel Capital which have a longstanding and active presence in the UK market are also inexplicably absent. 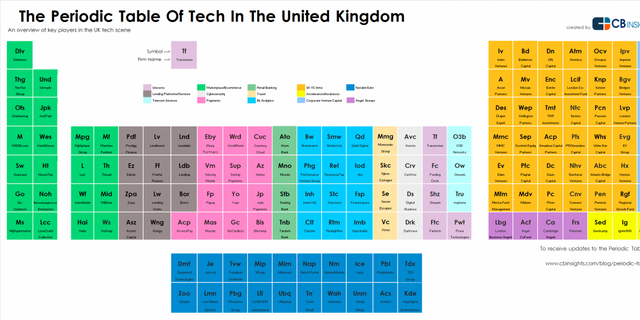 Analysts at research firm CB Insights have produced a customised periodic table that aims to map the UK tech scene. While the traditional periodic table groups chemical elements based on their properties, the "Periodic Table of UK Tech" groups 146 technology companies and investors alongside others in their field. The table, published on the CB Insights blog yesterday, is based on CB Insights data around funding, company momentum, and recent investments in the space. It includes UK success stories like overseas money transfer service Transferwise, music identification app Shazam, and fashion retailer Farfetch, as well as VCs like Index Ventures, Accel Partners, and Balderton.